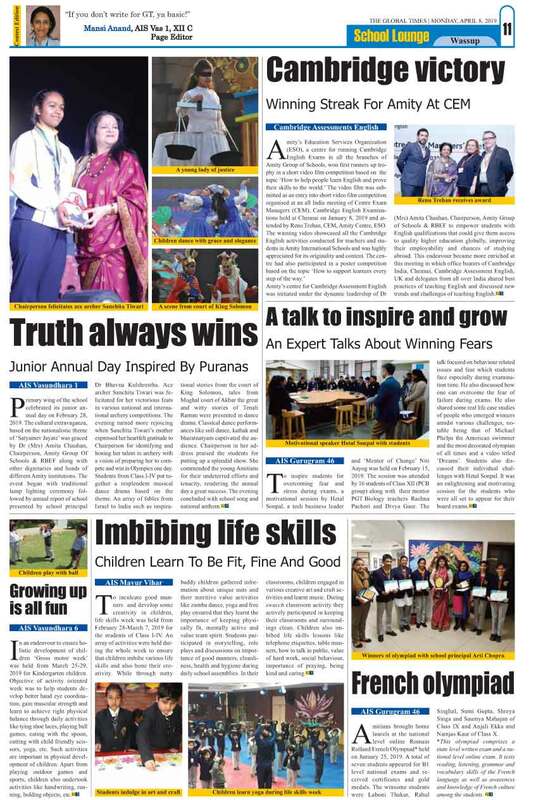 Primary wing of the school celebrated its junior annual day on February 28, 2019. The cultural extravaganza, based on the nationalistic theme of ‘Satyamev Jayate’ was graced by Dr (Mrs) Amita Chauhan, Chairperson, Amity Group Of Schools & RBEF along with other dignitaries and heads of different Amity institutions. The event began with traditional lamp lighting ceremony followed by annual report of school presented by school principal Dr Bhavna Kulshrestha. Ace archer Sanchita Tiwari was felicitated for her victorious feats in various national and international archery competitions. The evening turned more rejoicing when Sanchita Tiwari’s mother expressed her heartfelt gratitude to Chairperson for identifying and honing her talent in archery with a vision of preparing her to compete and win in Olympics one day. Students from Class I-IV put together a resplendent musical dance drama based on the theme. An array of fables from Israel to India such as inspirational stories from the court of King Solomon, tales from Mughal court of Akbar the great and witty stories of Tenali Raman were presented in dance drama. Classical dance performances like sufi dance, kathak and bharatnatyam captivated the audience. Chairperson in her address praised the students for putting up a splendid show. She commended the young Amitians for their undeterred efforts and tenacity, rendering the annual day a great success. The evening concluded with school song and national anthem. Amity’s centre for Cambridge Assessment English was initiated under the dynamic leadership of Dr (Mrs) Amita Chauhan, Chairperson, Amity Group of Schools & RBEF to empower students with English qualifications that could give them access to quality higher education globally, improving their employability and chances of studying abroad. This endeavour was enriched further at this meeting in which office bearers of Cambridge India, Chennai, Cambridge Assessment English, UK and delegates from all over India shared best practices of teaching English and discussed new trends and challenges that lie ahead. To inspire students for overcoming fear and stress during exams, a motivational session by Hetal Sonpal, a tech business leader and ‘Mentor of Change’ Niti Aayog was held on February 15, 2019. The session was attended by 16 students of Class XII (PCB group) along with their mentor PGT Biology teachers Rachna Pachori and Divya Gaur. The talk focused on behaviour related issues and fear which students face especially during examination time. He also discussed how one can overcome the fear of failure during exams. He also shared some real life case studies of people who emerged winners amidst various challenges, notable being that of Michael Phelps the American swimmer and the most decorated olympian of all times and a video titled ‘Dreams’. Students also discussed their individual challenges with Hetal Sonpal. It was an enlightening and motivating session for the students who were all set to appear for their board exams. In an endeavour to ensure holistic development of children ‘Gross motor week’ was held from March 25-29, 2019 for Kindergarten children. Objective of activity oriented week was to help students develop better hand eye coordination, gain muscular strength and learn to achieve right physical balance through daily activities like tying shoe laces, playing ball games, eating with the spoon, cutting with child friendly scissors, yoga, etc. Such activities are important in physical development of children. Apart from playing outdoor games and sports, children also undertook activities like handwriting, running, holding objects, etc. To inculcate good manners and develop some creativity in children, life skills week was held from February 28-March 7, 2019 for the students of Class I-IV. An array of activities were held during the whole week to ensure that children imbibe various life skills and also hone their creativity. While through nutty buddy children gathered information about unique nuts and their nutritive value activities like zumba dance, yoga and free play ensured that they learnt the importance of keeping physically fit, mentally active and value team spirit. Students participated in storytelling, role plays and discussions on importance of good manners, cleanliness, health and hygiene during daily school assemblies. In their classrooms, children engaged in various creative art and craft activities and learnt music. During swacch classroom activity they actively participated in keeping their classrooms and surroundings clean. Children also imbibed life skills lessons like telephone etiquettes, table manners, how to talk in public, value of hard work, social behaviour, importance of praying, being kind and caring. Amitians brought home laurels at the national level online Romain Rolland French Olympiad* held on January 25, 2019. A total of seven students appeared for B1 level national exams and received certificates and gold medals. The winsome students were Laboni Thakur, Rahul Singhal, Sumi Gupta, Shreya Singa and Saumya Mahajan of Class IX and Anjali Ekka and Namjas Kaur of Class X. *This olympiad comprises a state level written exam and a national level online exam. It tests reading, listening, grammar and vocabulary skills of the French language as well as awareness and knowledge of French culture among the students.